“It was pretty much boarded up, and we kept thinking that it was the perfect location for a marine science center because of the excellent water quality and circulation beneath the dock,” says Libby. When they approached park management with their idea, however, they were met with only a lukewarm reception. Their dream took a quantum leap forward, however, when Dave Bonnett and Jim Henderson -- both board members at the Poulsbo Marine Science Center -- leveraged their state government connections in Olympia and advised Libby and Judy to immediately form a non-profit so that they could request access to the building on the dock. Looking back, both women remember the non-profit application process as an easy one, and they were soon moving into the building on the pier. There was a condition however: The building could be utilized in exchange for maintaining a marine life exhibit for park visitors during the summer. “After we got permission to use the building in 1982, we quickly created an exhibit with aquariums we found at yard sales, touch tanks we built with our partners and whatever we could find at no cost,” says Judy. “We opened up to the public that summer. “When we got the approval from state parks, it was an annual lease, so we had to sign a new lease every year, and we could not take money at the door, only donations,” Judy adds. The duo collected donations of 25 and 50 cents and were not taking any salary, but friends came and helped out. Among the burgeoning volunteer corps were interns from Evergreen State College and from the now defunct government CETA (Comprehensive Employment and Training Act) program. Operating in the building on the pier presented its own challenges. While it was rough around the edges, it was acceptable for summer classes. However, when the cold wind was blowing in the winter, it was practically uninhabitable. By the summer of 1983, the center was growing. More aquarium tanks were donated by the Feiro Marine Life Center in Port Angeles and a local store in town that was going out of business. That same year, the state replaced the pier’s old pilings and railings. Libby and Judy also continued to pursue their passion for teaching children, partnering with Mr. Carlson’s 2nd grade class at Grant Street Elementary School. Each week, they would bring tanks teeming with marine life into the classroom and conduct a hands-on lesson for the students. Another project was the acquisition of a hydrophone, motivated by an interest in orca whale behavior and the sonic communications within orca pods. How the listening device was obtained is described in a blog entry in 2012 here. Despite their success, the next few years would be challenging ones. Libby’s partner, Henry, was diagnosed with cancer, necessitating a move to a more temperate climate in New Mexico. Meanwhile, Judy, in the midst of a divorce, was juggling the responsibilities of parenting while commuting to Seattle to earn her teaching certificate. Somehow, Judy and a growing core of volunteers managed to forge ahead. And despite the occasional power outage or pump failure, they kept things going. The pumps never stopped and the visitors kept coming. 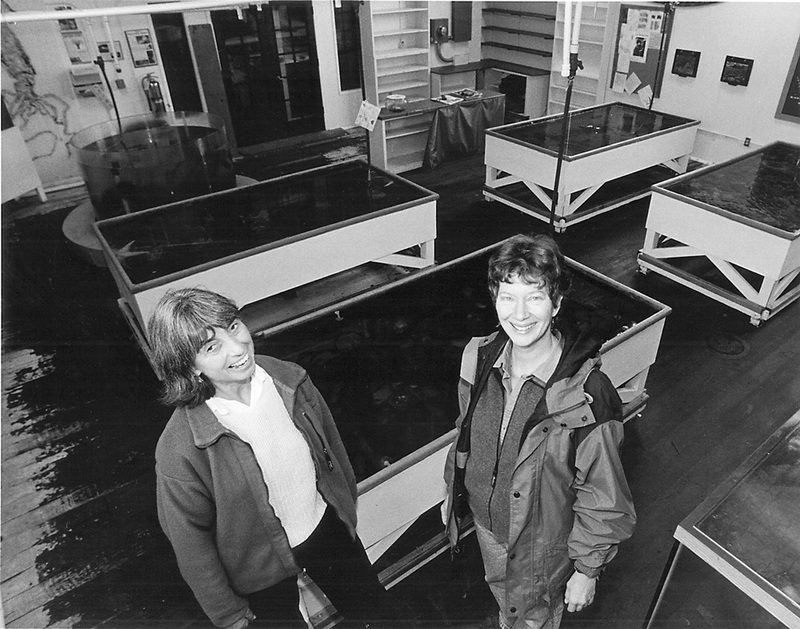 Looking back on those difficult times, both women credit the volunteers, especially Diane Gusset, Dixie Llewellin and Joanne Johnson for being the driving force in keeping the Marine Science Center doors open. Although Libby would be away for five years (until 1990), Judy always took the long view. “I was sure Libby would be coming back, and I knew I needed to keep the place going,” she says. Libby and Judy are such incredibly inspiring women! I love reading the details and seeing photos of the origins of PTMSC in this blog. Thank you!